Over a century ago, filmmakers Sagar Mitchell and James Kenyon roamed Britain and Ireland filming the everyday lives of people at work and play. For around 70 years, 800 rolls of this early nitrate film sat in sealed barrels in the basement of a shop in Blackburn. Miraculously discovered and painstakingly restored by the BFI, this now ranks as the most exciting film discovery of recent times. Following on from the hugely successful BBC TV series, The Lost World of Mitchell & Kenyon and the BFI's first DVD volume Electric Edwardians are two DVDs containing a new unreleased selection of films – Mitchell & Kenyon in Ireland and Mitchell & Kenyon: Edwardian Sports. 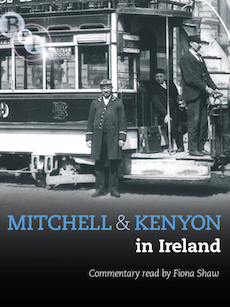 Mitchell & Kenyon in Ireland is a unique and vivid record of Ireland at the start of the twentieth century. The Mitchell & Kenyon collection contains some 26 films made in Ireland between May 1901 and December 1902 in association with three travelling film exhibitors – the North American Animated Photo Company, the Thomas Edison Animated Photo Company and fairground showman George Green. Much of this material has been unseen for over 100 years. Presented as 'Local Films for Local People', the films include street scenes of Dublin, Wexford and Belfast, local dignitaries attending the Cork International Exhibition, scenic routes from Cork to Blarney Castle and much more.